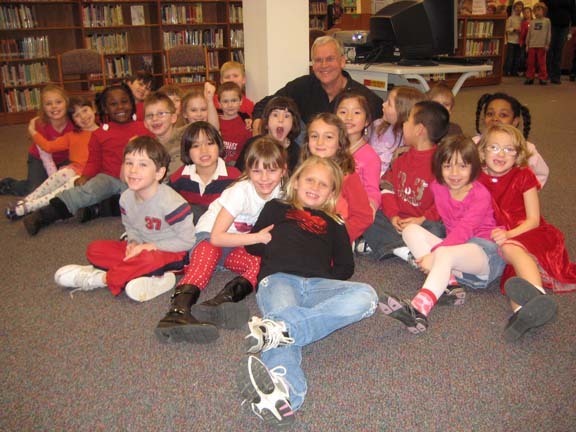 Here is the author with some enthusiastic readers at Pine Knob school in Clarkston, Michigan. My name is Kristi Earle and I work at the Wadsworth Public Library. We are currently planning for our winter program guide and wondered if you would be interested in presenting a program. We are particularly interested in a program reviewing editorial cartoons and their role or humor during times of crisis, their political influence on history, etc. Would you are someone you know be interested in taking on such a task? Please let me know if you or someone you know is interested and we can hammer out the rest of the details. Hi, Kristi. Could you please send me a proposal including date and time by email to chip@bokbluster.com? Thanks.